Friday night is usually treat night where my husband and I indulge in wine and order a takeaway, falling into a heap watching netflix. I’m bored of all the takeaway options in my area so I’ve come up with a quick and delicious home cooked alternative. It’s fresh, healthy and beats any takeaway. It does require a bit of forward thinking with some prep the night before but once you’ve done that Friday night will be a breeze. 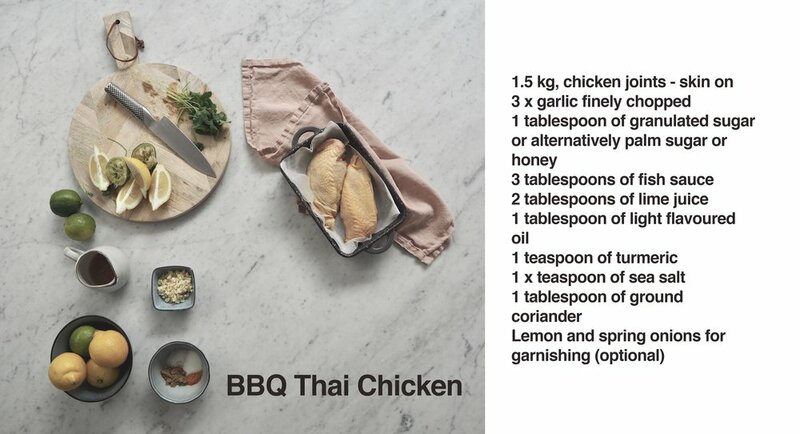 This Thai BBQ recipe has been a favourite of mine for some time and is a simplified version of the BBQ Thai chicken that I discovered in Thailand. The recipe is from Bill’s Everyday Asian by Bill Granger. The great thing about this recipe is that you can prep it the night before, which is brilliant if you’re entertaining or if like me you just want something easy and tasty for an alternative Friday night takeaway. Method: Place all the ingredients in a large bowl and whisk together. Pour over the chicken and rub into the skin making sure every part of the chicken is covered. This can be done the night before or two hours prior to cooking. You can either cook in an outdoor BBQ or alternatively in an oven. If using an oven cook accordingly to the packet instructions. I cooked mine in the oven for 30min on 170 degrees (fan oven) and then finished it off on my indoor BBQ until the skin was crispy and charred. If you’re throwing a BBQ with friends pre cooking the chicken in the oven will ensure you spend more time chatting with your friends and less time at the BBQ. 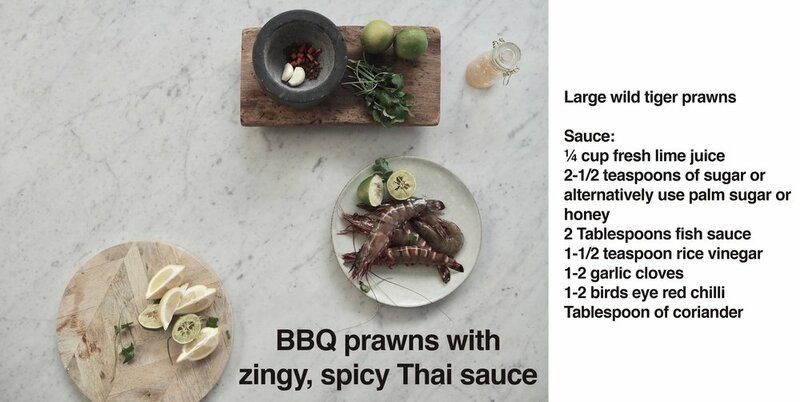 Once your chicken is cooking away you can start prepping the prawns and make the zingy, spicy Asian sauce. Again you can also make this sauce the night before or up to a week in advance. Now would be a good time to put the rice on. Further below is my tip to cooking perfect fluffy rice. Prep the prawns by using scissors to cut down the back of the spine, removing the vein. Leave the shell and head in place. You can of course remove the head but keep the shell on to lock in the moister when you cook. Keep in the refrigerator until you are ready to cook. Once the chicken is coming off the BBQ add the prawns and cook until the prawns turn orange and meat is opaque. It’s ok if the shell gets charred this adds to the flavour. In a pestle and morta add the garlic, chilli and sugar. Grind until you have a rough paste. Put this in a bowl with the lime juice and rice vinegar, mixing together. You can store this in the fridge until you are ready to use it. To serve add it to a small dipping bowl and add the chopped coriander on top. 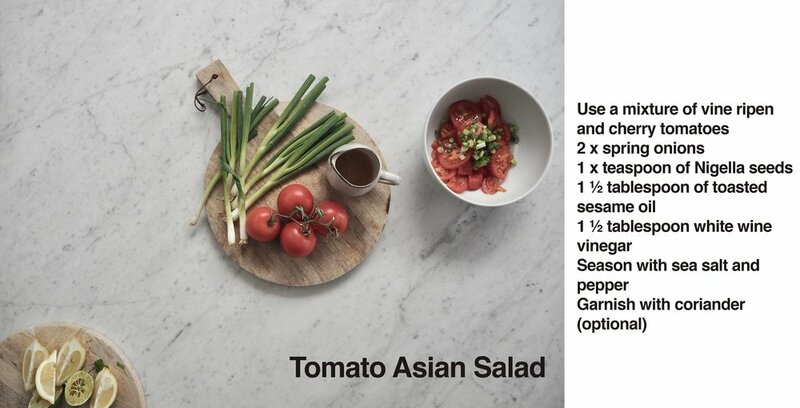 Sometimes the simple things are often the best and that’s certainly the case with this tomato salad. It’s so refreshing and the toasted sesame oil adds another layer of flavour. This is easily one of my fave salads. Roughly chop and slice the tomatoes and if you like use a variety of different colour and shaped tomatoes for extra wow factor. Sprinkle with spring onions and nigella seeds. Mix together the white wine vinegar, sesame oil and pour over the salad just before serving and if you like garnish with coriander and a squeeze of lemon. Don’t forget to season with salt and pepper. Once the chicken has been in the oven for 15 min put the rice on. To get perfect fluffy rice simply put equal parts water and rice into a saucepan. One cup of rice and one cup of water or two cups of rice and two cups of water. Bring water to a boil in a saucepan and add rice, then turning down to simmer, cover with a lid and leave a little opening to let some of the steam release. Leave it for 10-12 min according to the packet instructions. Once the time is up the rice should be dry, fluffy and ready to serve. To finish of sprinkle with nigella seeds and coriander on top. Serve everything at once and get stuck in. It really is a quick and easy meal to prepare and is super delicious. It’s also much healthier than your local takeaway! Winning! Enjoy and let me know how you get on. If you would like to see more recipes like this please comment below or like this post. I believe having purpose and focus sets us on a path to happiness. 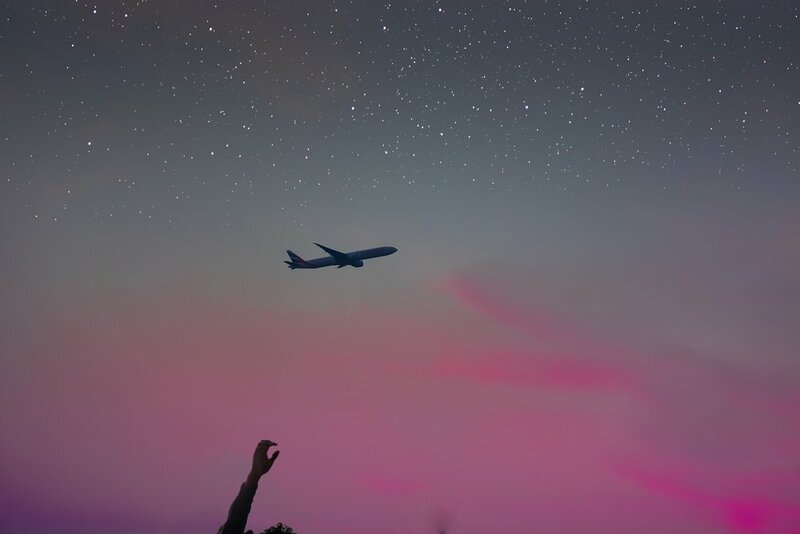 Without a destination we kind of fumble our way through life and it’s easy for us to get distracted and feel a little lost, which brings uncertainty and can lead to sadness or anxiety. Once you know what you want you can then map out in small steps how to get there and that’s exciting because all of a sudden you can see that reaching your goals may just be achievable. Setting goals is like creating a life roadmap that guides you in the right direction and helps you stay on track to reach your dreams. When we achieve things, it makes us feel fulfilled and this brings happiness. So, imagine if you could achieve all your heart desires? You would feel freaking awesome and that’s what goal planning can do for you. I love bringing my goals to life by creating a vision board. I’m very visual and if I can visualise or see my goals daily then this is a helpful reminder to keep me on track. If you write your goals down it’s so easy to put them in a drawer and forget about them. 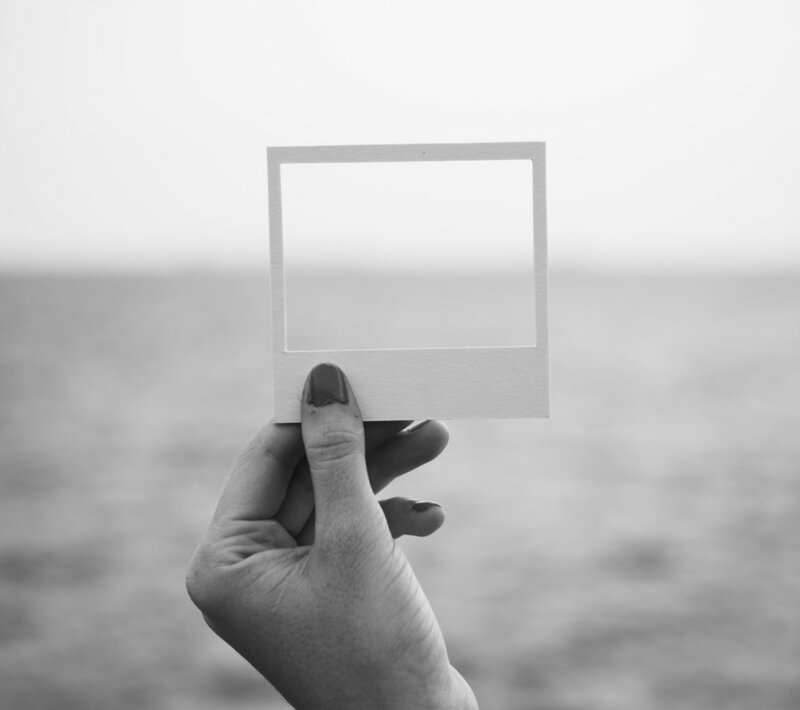 So, I’m going to give you a quick how to on setting achievable goals and how to bring them to life through creating a vision board. Sound good? Ok let’s get started. Finding your purpose means finding a way to use your unique skills and passions in life. To have purpose is to have fulfilment, which I believe can lead to a happier life. For some people they find their purpose early on and for others it takes time, months, years of reflecting and exploring to find their true purpose. There is no hard-fast rule when it comes to your purpose in life and each person’s journey is unique and personal to them. Below are some questions from the MI goals diary that will help you to understand the intersection between your passions, your skill and what will most add value. 2. What subjects do you enjoy learning about? 3. What activities do you do, even when it’s not fun? 4. What do you find easy that other people seem to struggle with? 5. What do you love doing that also helps other people? It’s good to get an understanding of where you’re at in your life now to highlight the areas that you want to work on. For each category below write down the number that best represents you now. It would be useful to visit this in a year’s time to see how much progress you’ve made. Circle below which is most relevant to you. Hopefully you’re getting a good sense of all the things that make you happy and a good idea of your skill set and passions. You should also be able to see the areas of your life that need adjustment or further work. This should be a good base to start working on your goals. Set goals that you are passionate about. It you set goals for the sake of setting goals then you’re more likely to not achieve them. When setting goals ask yourself am I really committed to this? Does this set my heart on fire? When setting goals use the SMART goal setting principle to help write and confirm your goals. MEASURABLE: Can you measure the out-come of the goal? Concrete criteria helps you stay on track, so you can have a benchmark to work from. ACHIEVABLE: Is the goal actually attainable? We should dream big, but you also need to be realistic and live within our own reality. If buying a house is part of your dream and you work hard to save a deposit over a certain amount of years etc this could be your reality. If you decide that you want to be the next Beyoncé but can’t sing you’re probably living in a fantasy world. RELEVANT: Make sure your goals are relevant to your values and actually matter to you. TIMELY: Set a timeframe to make it more real and increase urgency. BRAOD GOAL EXAMPLE: I want to grow my business in 2019. SMART GOAL EXAMPLE: I will expand my product range by 30% in the first two months of 2019 to give customers more choice, launching a social media campaign to promote our new range to increase awareness and to grow our audience. I will put x amount into PR and target key opinion leaders and relevant publications. This will help grow my business and increase my revenue by x amount. Remember to dream big don’t just set goals that are easy to achieve. Go out of your comfort zone because that’s where the magic happens. Now go ahead and brainstorm some ideas and come up with your goals. I would say 1-10 goals is enough. With each goal ask yourself what do I want to accomplish, why, when and how. List your key milestones and write a to do list to achieve them. Now that you have crystal clear goals in place you are now ready to work on your vision board. 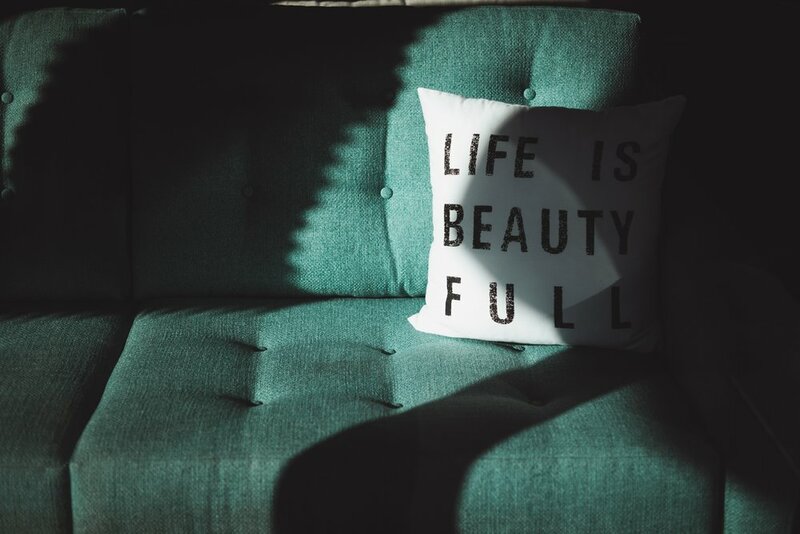 What you will need: A3 cardboard, glue stick, scissors, magazines, small mementoes, postcards, images from Pinterest, personal photos – essentially anything that will help bring to life your goals and dreams. 1. If you followed the steps above, you should now have crystal clear goals for 2019. If you haven’t done the work, go back and follow my steps. I promise this will make all the difference. 2. It’s easy to get distracted by pretty picture in magazines or on Pinterest. Keep on track by referring to your goals that you worked on above. You want to chase your own dreams not someone else’s dreams. Stay authentic to you and stay on track. 3. Find pictures of how you want to feel not what you want. If you want a car find a picture of the exact car driving in a beautiful scenery with the roof down and now picture yourself in that car and think about how you might feel – is it freedom, excitement? etc That vs a picture of car in a dealership is going to get you more excited and help visualise you in that moment and therefore you are more likely to stay motivated and focused. 4. You can put all you goals onto one board, but you could also separate them and have one for work/business or even your love life or health. There’s no rule it’s purely down to what works best for you. 5. Cut or print out any pictures, quotes, words that help bring your goals and dream to life. Carefully arrange them onto your board. When you’re happy stick them down. 6. Place your vision board somewhere visible that you’ll see every day. The bathroom, bedroom or office is a great place and will help you get your day started right. 7. Dreams need actions so make sure you review daily/weekly and set small steps each week to ensure you stay on track towards hitting your end goal. 8. Choose a friend or family member to be your accountability partner and ask them to check in with you weekly or monthly to see where you’re at. I know for a lot of people reading this you’ll be thinking I don’t have the time but trust me you do, or you just need to make time. You could nail this in a couple of afternoons. Book the time in your diary as you would with any other appointment. If you have kids ask your husband, friends or family to take them off your hands for the afternoon. There is always a way you just need to make it happen. I hope the above gets you excited and helps you on your way to achieving all your heart desires this year. Let’s make this the best year we can, because you all deserve it, we all do. Happy New Year and here’s to a brighter year ahead. Happy New Year! We love this time of year! With a fresh start and renewed optimism, we have a feeling 2019 is going to be even better than 2018. As we wrap up the festive season and get stuck into winter, we have some great suggestions of what you can get up to. Whether you’re off the booze for dry January, looking to adopt a healthier lifestyle or you just want to explore some new spots we’ve got some great ideas for you. The world of espionage has changed and they need your help more than ever. Should you accept, you will receive your mission briefing, including; alias, target location and further classified information. 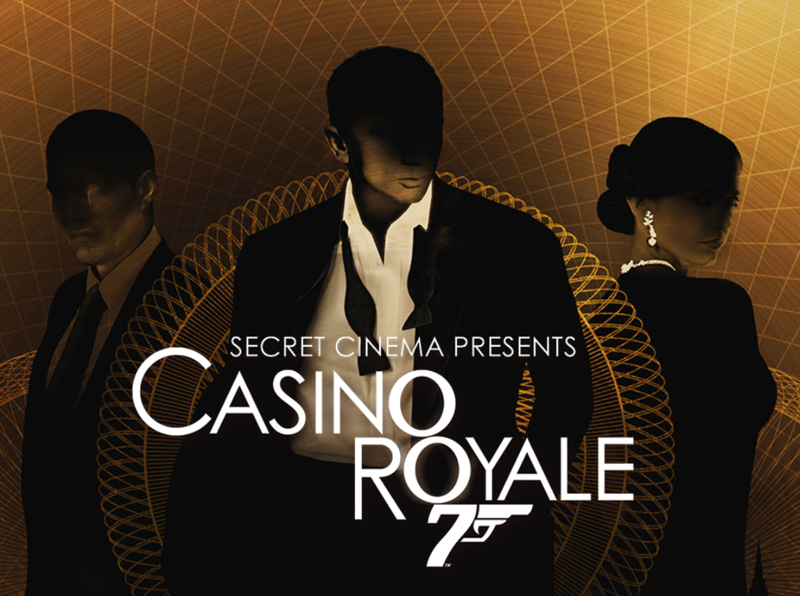 Are you ready to enter a world of high stakes, sophistication and deception? Operate in the shadows or be in the heart of the action where the risks are great, but the rewards are greater. The time has come to find out if you have what it takes. Housed in a converted Linoleum factory in the square mile, Lino are taking a new approach to drinking and dining in the city. They re-use, re-love and re-imagine. From salvaged light fittings to sustainably sourced materials – they give overlooked pieces a chance to shine. They bake, ferment, pickle and cure onsite. They mix old classics and shake up new combinations. They make the most of seasonal shrubs, herbs, fruits and veg - everything they serve is inspired by what’s available. Inspired by Hollywood Movies and TV that have brought to life America’s most infamous prison, Alcotraz is London's first immersive theatrical cocktail bar. From the orange jumpsuits upon entrance, to the real metallic cells, Alcotraz becomes the perfect backdrop to enjoy a drink within an epic yet intimate environment. When convicted to Alcotraz, inmates are taken into an exciting world of mischief as they are instructed by notorious bootlegger, Clyde Cassidy to smuggle-in liquor to be used to make delicious, bespoke cocktails. You won’t find a set menu of drinks here…after all, it is prison! Alcotraz creates a range of tailored cocktails every night based on the liquor you bring and your tastes. Just make sure The Warden doesn’t catch you. Luckily, our Guards are on your side and have creative ways of hiding contraband. The incredible Ballie Ballerson is like no other bar you’ve ever been to. A world famous venue featuring over ONE MILLION balls, it will magic you right back to the fun of the playground like a ball pit time machine. 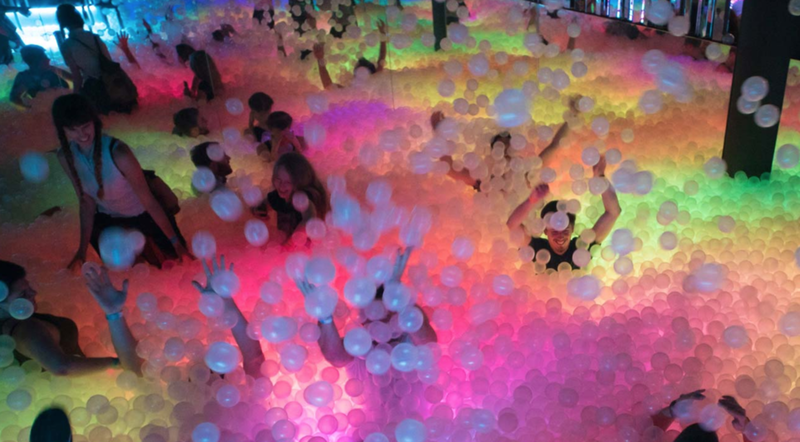 Whether you’re being a baller in our VIP section, drinking Dibbie Dabbersons on the dance floor, or making a name for yourself in one of the ball pits, it’s an experience that will keep you smiling for hours and have your Insta feed begging for more. Nothing beats an open fire at this time of year. And if you don’t have one of your own, why not head out and explore some great pubs that have roaring fires at the ready. The Nudge has put together a list of pubs across the capital to check out. Find the perfect spot to warm up in after an afternoon walk in some London’s parks. A couple of our favourites are Richmond Park and Primrose Hill. Learn a new skill - how to make fermented and naturally preserved foods with artist and food-designer Inês Neto dos Santos. Can eating bring us closer to our bodies? Can it help us engage with the world? What can it teach us about who we are, where we come from or where we’re going? Led by artist and food-designer Inês Neto dos Santos, this one-day workshop provides a hands-on introduction to the art of fermentation and other natural preserving methods. Over the course of the day, you will be introduced to the history, health benefits and methods of these techniques, before using a range of ingredients to create your own edible stories to take away at the end of the workshop. Participants will also have the opportunity to visit the Design Museum’s current exhibition Home Futures and to learn more about Inês’ ongoing project Fermen-Tour. Psycle is a premium boutique fitness brand that offers a collection of class based workouts across London. Their immersive, energetic workouts are designed to help clear your mind and transform your body alongside a passionate community of like-minded individuals. With four different workouts and a team of highly knowledgeable instructors, Psycle classes harness the transformative power of movement to help every individual optimise their fitness and wellbeing.